Description: Splish, splash! It's a birthday bash! 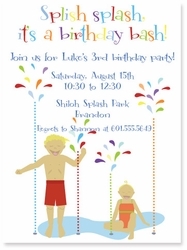 Set the tone for fun with this colorful splash pad party invitation. Choose to show two boys, two girls or one of each in the dropdown menu.